There are two Greenpoint Landing high-rises on the waterfront, and more are on the way. See page 2. LEFT: Welcome to Manhattan Avenue, which is dotted with Polish bakeries, butchers and Photo courtesy of Brooklyn Expo Center restaurants. See story on page 4.
power to transform the neighborhood. Greenpoint Landing is located at the end of Franklin Street. So that’s the street I sought out to ask people what they think about this development. MASON MAYER LABS LLC. ARTS. Brooklyn politicians say constituents are complaining. 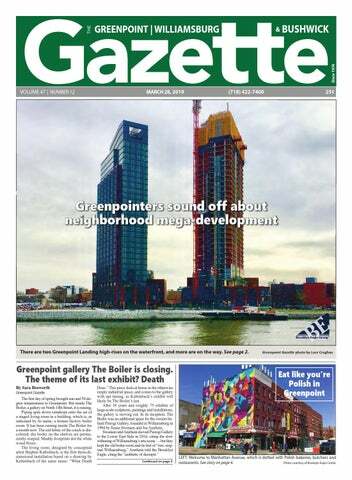 “Often there are two points of view to an issue,” Brannan told the Greenpoint Gazette. “With these floating monstrosities, though, not one constituent has come to me and said they going to Shore Road Park so they can see a billboard in the harbor. “What I have heard from just about everybody, though, is that they are ugly and actually pretty dangerous because they distract drivers on the Belt Parkway.” Zachary Carter, corporation counsel for the New York City Law Department, sent a letter on Jan. 1 to Adam Shapiro, CEO and president of Ballyhoo, alerting him that he was breaking the law. “There is sufficient cause to believe that Ballyhoo’s operations in New York City violate the Zoning Resolution,” Carter wrote. “Therefore, we are writing to provide Ballyhoo with an opportunity to demonstrate, no later than Jan. 16, 2019, how it intends to comply.” Senior counsel Brian Horan, who co-signed the letter with Carter, did not respond to a request for comment asking how Ballyhoo responded, if the Miami-based business had complied with the letter’s requests or if the city had levied any fines against the company. At the time, Shapiro denied that his company was breaking any laws, and his barge has continued to roam the waters ever since. “Ballyhoo Media is legally operating based on all current zoning resolutions,” he told the Gazette. “We plan to work with the city to resolve the matter shortly.” Visit brooklyneagle.com for the full story. OF ORG. FILED WITH THE SSNY ON 02/27/19. OFFICE: KINGS COUNTY. SSNY DESIGNATED AS AGENT OF THE LLC UPON WHOM PROCESS AGAINST IT MAY BE SERVED. SSNY SHALL MAIL COPY OF PROCESS TO THE LLC, 201 WEST 72ND STREET, #12G, NEW YORK, NY 10023. PURPOSE: ANY LAWFUL PURPOSE. TOWN WEST PORTFOLIO LENDER LLC. ART. OF ORG. FILED WITH THE SECY OF STATE OF NY (SSNY) ON 8/14/18. OFF. LOC. : KINGS COUNTY. SSNY HAS BEEN DESIG. AS AGENT UPON WHOM PROCESS AGAINST IT MAY BE SERVED. THE ADDRESS TO WHICH THE SSNY SHALL MAIL A COPY TO IS: THE LLC , 225 BROADWAY, 32ND FLR., NEW YORK, NY 10007 . PURPOSE: ANY LAWFUL ACT. CATION: KINGS COUNTY. SSNY DESIGNATED AS AGENT OF LLC UPON WHOM PROCESS AGAINST IT MAY BE SERVED. SSNY SHALL MAIL PROCESS TO GEORGE RUGGIERI, 60 CRINE RD., COLTS NECK, NJ 07721. PURPOSE: ANY LAWFUL ACTIVITY. Amrhein joked that if Kaltenbach’s exhibit had gone up in 2009, when The Boiler first opened, they wouldn’t have needed to install a rain machine. “The roof would just leak,” he said. Amrhein and Swensen, who have been married for 20 years, added bathrooms and lighting and fixed up the 40-foot walls. But they stopped there, wanting to maintain the character of the original space. “The Boiler was unique for New York,” Amrhein said. Even so, he and Swensen had a hard time programming the space, especially as the artist community in the neighborhood became more and more diluted. “As gentrification took hold, it forced artists out.” Amrhein noted his concern for how a changing New York City would sustain a new generation of artists and talent. “It’s the doughnut effect — in the art world.” When Pierogi Gallery first opened in the mid-90s, Williamsburg was in its creative prime, said Amrhein. The neighborhood helped open the gates to the rest of the borough — “it became undeniable that for art, you had to come to Brooklyn.” But by 2016, the arts scene had thinned out considerably. Pierogi Gallery no longer benefitted from the once heavy foot traffic of artseekers, and Amrhein and Swensen relocated across the East River, where the Lower East Side offered a higher density of galleries and gallery-goers. And now, once they leave the Greenpoint space behind, the couple behind The Boiler will have moved on from Brooklyn entirely. “What Death Does,” which so smoothly mirrors the “aesthetic of decrepit” Amrhein valued in the gallery’s character, is on view until March 31. It is the last exhibit The Boiler will present in its current form. Amrhein hopes the owners of the space, who have been “great landlords” for the gallery, will retain the name. “This name belongs with this space,” he said, looking around at the empty room around the staged set. “It’s been an incredible reward.” The Boiler is open noon to 6 p.m. from Friday-Sunday and by appointment. It is located at 191 N. 14th St. Follow reporter Sara Bosworth on Twitter. Stephen Kaltenbach, “What Death Does,” Installation View at The Boiler, February 2019. Don’t expect to find “Call of Duty” or “Fortnite” at Bushwick’s newest indie arcade bar. Wonderville, set to open at 1186 Broadway in May or June, is looking to flip the script on the idea that video games are violent, anti-social distractions for kids. The venue, which will double as an event space, will showcase dozens of independent games, many of which are made by Brooklynites. Co-owners Stephanie Gross and Mark Kleback are hoping to open Wonderville, a new arcade in Bushwick, in the coming months. experimental games? Barcade can have all the old arcade machines and we can have all of these new art arcade machines.” Kleback said that while he enjoys playing larger, more wellknown games that have the backing of massive game studios, he also wanted to support emerging artists. “Supporting indie games doesn’t mean you can’t support bigname titles,” he said. “There’s room for both in the world. It’s the same thing between supporting that band that plays at the local club versus Radiohead. “We want to be a platform for that kid who just graduated from the game center who created a really amazing game all by himself for his thesis, and now he wants to showcase it somewhere.” Gross and Kleback, who both live in Bedford-Stuyvesant, hope to not only provide a space to let loose, but also one that allows visitors to learn about graphic design, fabrication and game development. The space will routinely host classes, workshops and talks with developers, as well as tournaments, playtest nights, board games, comedy, live music and rotating art exhibits. “Games are art pieces,” Kleback said. “It’s not necessarily a commercial thing that you buy and pay for, but it can be this experience where you learn things along the way.” Follow reporter Scott Enman on Twitter. INCOME TAX PREPARATION Free Confidential Initial Consultation New clients, call or visit us online today and schedule your consultation to discuss your accounting needs with a qualiﬁed professional. Jedzmy! That’s how to say “Let’s eat” in Polish. You can have an ethnic-food adventure in Greenpoint even if you didn’t know that. The neighborhood’s commercial corridor, Manhattan Avenue, is dotted with Polish bakeries, butchers and restaurants. They are living reminders of the neighborhood’s history as a heavily Polish enclave. It’s true that lots of customers in these restaurants and shops speak the language. But the people who work in them will be nice to you even if you don’t. It also doesn’t matter if you know next to nothing about traditional Polish cuisine, like me. My late granny was half Polish, but I only learned a couple Polish swear words from her. And my pronunciation of them is so bad that people who actually speak Polish can’t figure out what I’m saying when I try them out. Sadly, my Nana died when I was young. She never had a chance to give me Polish cooking lessons — or Polish eating lessons, for that matter. She spent so much time feeding her Irish husband and his Irish kinfolk that her Polish recipes fell by the wayside. So on Wednesday I decided I could remedy my ignorance. I invited myself to the Polka Dot Café at 726 Manhattan Ave. Don’t let the English-language name fool you. The menu is Polish from top to bottom. “Young people don’t have time to cook,” Parys told me. The Polish fare she sells is traditional. “These are recipes people knew 100 years ago,” she said. When the café owner needs to hire a cook, the person doesn’t have to be a professional chef. She learned all about Polish cuisine at home. “I know she can cook because she has family,” Parys said. Though I showed up with no advance warning, café owner Marzena Parys kindly gave me a tutorial in How To Eat Like You’re Polish. Which of course I partly am. Until five years ago, she ran Polski Meats, a business her late husband had launched. Then she decided a restaurant and prepared-food shop made more sense than a meat shop because of the influx of young residents to Greenpoint. Pork cutlets and potato dumplings I asked Parys to pick out a typical lunch a restaurant would serve me if I went to Warsaw. She said a pork cutlet, sweet cabbage — which is minced up and tastes really good — mashed potatoes and cucumber salad. At Polka Dot Café, customers are more likely to order chicken cutlets. This is a meatless Polish lunch plate at Polka Dot Café. Also, it’s very Polish to go meatless for lunch. (Off in the distance, I can hear applause from the city Department of Education, with its Meatless Mondays.) An appetizing and very Polish meatless lunch would include the sweet cabbage with a serving of kasha with finely minced vegetables such as peppers and corn in it plus a serving of beet salad. Parys patiently spelled out the Polish-language names for many dishes. I’m afraid I might type them wrong and embarrass myself, so I left them out of this story. A meatless lunch could also include pierogi — pockets of dough with filling. The potato and cheese variety is the most popular at Polka Dot Café. And potato dumplings are a big Polish thing. She showed me a vegetable salad that everybody serves at parties. Café manager Agata Podgorska pointed out that if I had arrived in time for breakfast, pancakes filled with chopped apples would be a perfect Polish menu choice. Also there are Polish doughnuts called paczki. They have rose jelly filling in them and are served as dessert. STEAMROLLER COLLABORATIONS YVETTE DRURY DUBINSKY AND VICKY TOMAYKO A two-person exhibition of work by New York Artist Yvette Drury Dubinsky and National Artist Vicky Tomayko. Dubinsky and Tomayko will be showing fifteen large monotypes with drawing and collage. SAVE UP TO 25% ON TICKETS! * APRIL 13 & 14 *Offer valid on select tickets and performances. Use Code: BKEAGLE • msg.com/bkeagle *Offer not valid on previously purchased tickets and cannot be combined with any other offer. 8 ticket limit. Discount is calculated off of the original box office price. Service charges apply to telephone and internet orders. All sales are final - no refunds or exchanges. Offer may be revoked or modified at any time without notice and is subject to availability. Other restrictions may apply. Offer expires April 14, 2019. Accessible and companion seats are available via the Disabled Services Department at 888-609-7599. ©2019 MSG Sports & Entertainment Holdings, LLC. All rights reserved. © 2019 Spin Master. 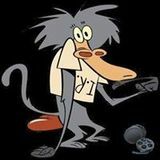 PAW Productions Inc. All Rights Reserved. we can look at the ways we’re fed imagery on a daily basis and teach us how to discern for ourselves what that imagery means to us. Other Ways of Knowing references illusion and misdirection traditionally designed to influence choice and transforms them into a new visual language. This digital iteration of Other Ways of Knowing features new additions to the series never exhibited before. The screens in the Made in NY Media Center will challenge the viewer to interact with a screen – a daily routine part of our lives – within a new context, one where you’re asked to stay for longer. This exhibition explores the narrative of the series in a new and refreshing way, accomplished by the unique collaboration of the space and the artist. When: Daily through March 31st, Mon-Fri 9 a.m. – 7 p.m., Sat-Sun 10 a.m. – 6 p.m. LIVING INSIDE SANCTUARY For two years, Brooklynbased photojournalist Cinthya Santos Briones has photographed undocumented migrants who face orders of deportation. By taking up asylum in houses of worship, often for indefinite periods of time, these individuals and their families have found both a refuge and a provisional prison. Santos Briones’ photographs are an intimate depiction of living in a state of uncertainty. Rather than present portraits of people in hopeless situations, she has chosen to convey the universal routines of their everyday lives. Birthdays are celebrated, siblings tease one another, and meals are shared. When: Daily through April 7th, 8 a.m. – 4 p.m.
screenings, stay for a Q&A with filmmakers. Program: Talking While Female (Kelli Anderson for NPR, 5 min.) Dangerous Curves (Merete Mueller, 2016, 12 min.) Fran This Summer (Mary Evangelista, 2018, 10 min.) Agua Viva (Alexa Lim Haas, 2018, 7 min.) Ice Cold (Sekiya Dorsett, 2018, 14 min.) Mami y Yo y Mi Gallito (Arisleyda Dilone, 2015, 16 min.) Hair Wolf (Mariama Diallo, 2018, 12 min.) When: Thursday, March 28th, 7 p.m.
Grand Canyon Restaurant on Montague Street has one of the most robust menus in Brooklyn. Breakfast, lunch and dinner; morning, noon or night, there’s something good to order. And the Mexican Burger makes for the perfect lunch or dinner. It’s 100 percent beef with avocado and jalapeño served with lettuce, tomatoes, french fries, coleslaw and pickles. This burger is so delicious, you don’t need any other toppings! The Grand Ballroom 1030 86th St, Brooklyn, NY 11228. Brooklyn Heights spreads out in a panorama above Brooklyn Bridge Park. tween DUMBO and Greenpoint is by getting on the ferry a stop early, over in Manhattan on Wall Street’s Pier 11. To amp up your experience, you should walk across the Brooklyn Bridge to get to Pier 11. This will give you aerial views of the East River before you head down onto the water. To avoid crowding on the bridge you can stroll it at sunrise – a bucket-list experience I highly recommend. nearly a half-century. The religious organization had a blazing red electric sign on top of 30 Columbia Heights that said “WATCHTOWER” in capital letters. Last year, current owner Columbia Heights Associates, which is converting the property to an office, retail and cultural complex, successfully challenged a city Buildings Department decision that forbade it from replacing the 15-foot-tall sign letters. The new letters have not yet been put up. I can’t wait to see what they say. After the ferry stops at Pier 1 it cruises past Jane’s Carousel, the historic merry-go-round in Brooklyn Bridge Park. At the edge of the park the 19th-century coffee warehouse complex called Empire Stores stands in all its landmarked, red-brick glory. Manhattan Bridge looms overhead, with the DUMBO Clocktower Building standing close by at 1 Main St. Manufacturer/real estate developer Robert Gair constructed the concrete building in 1914. The many industrial properties he built in the neighborhood a century ago are referred to as “Gairville,” as history lovers know. open house DYKER HEIGHTS – BUYER BROKER WELCOME! The Catskills are calling! Here is the perfect property to escape to from Brooklyn, bring all your friends and relax in the peace and quiet of this home and surrounding property. Plenty of spots for a ﬁre pit, especially next to the Pond. Main house has 5 large bedrooms + sleeping loft. Two full & 1/2 baths, remodeled kit. dining, laundry/half bath/sauna. Family room w/cathedral ceiling, stone ﬁreplace, sliding doors to a large wrap round deck & enclosed porch. Several sliding doors to deck and large grape arbors. Lovely guest cottage with eat in kit., living room w/stone ﬁreplace, bedroom, bath w/shower & sleeping loft, totally private from main house, rent on AirBnb for additional income. There is more; oversized three car garage, plenty of storage, large attic room and an oﬃce for working from home. This building has its own septic, water & heat. Wonderful property for the person who works from home. Barn and established veg. garden, fruit tress, woods, pond, lawn. This 49.80 acres borders State land, walking distance of state hiking trails, near three ski mountains, golf & more. Perfect for private retreat, large family, bed & breakfast, weddings, walk to well known West Kill Brewery. 47 x130. HUGE LIVING ROOM, 2 BEDROOM OVER 2. USED NOW AS MOTHER/DAUGHTER, HAS FULL HUGE BASEMENT AND ATTIC. ALL AMENTIES. Residential towers rise at the North Williamsburg ferry stop. The white building at right is Austin Nichols House. But first the boat will make a stop at the South Williamsburg ferry dock. Spitzer Enterprises is constructing a glittering glass apartment complex there, right at the water’s edge. The development’s address is 420 Kent Ave. After the ferry passes beneath the Williamsburg Bridge, you get an eyeful of the landmarked 19th-century Domino Sugar Refinery. Two Trees Management is converting it into an office and retail complex. There’s lots of great stuff in Domino Park, which surrounds the refinery, but it’s hard to see from your vantage point on the river. You should walk down to this park from Greenpoint after you’ve strolled around the neighborhood’s shops and historic houses. But I’m getting ahead of myself. Back to our ferry ride. Glassy high-rises will catch your eye long before the boat gets to the North Williamsburg dock. Alongside The landmarked Domino Sugar Refinery graces the Williamsburg shorethem, there’s a low-rise building made line. INBrooklyn photos by Lore Croghan of white reinforced concrete. It’s Austin Nichols House, designed by ar— Continued from page 10INB — chitect Cass Gilbert and built for a wholesale grocer in 1914 When you’re back on dry land you can read about Gairville and 1915. Now it’s a condo property. in a report the city Landmarks Preservation Commission Gilbert’s most famous design was the Woolworth Building wrote about the DUMBO Historic District. in lower Manhattan. Once the ferry passes the Manhattan Bridge there’s a pair The Manhattan views are epic at this point in the ferry ride. of buildings. The new one, which you’ll see first, is a condo The Empire State Building, the United Nations and the property whose address is 1 John St. Chrysler Building are there for you to see when you turn your The second one you’ll see, 10 Jay St., is a landmarked of- gaze to the East River’s opposite shore. fice building with a new glass facade on its river-facing side. After picking up passengers in North Williamsburg the The glass panels are shaped like sugar crystals because long ferry heads for Greenpoint. ago the building was the Arbuckle Brothers’ sugar refinery. A high-rise looming up ahead is called the Greenpoint. It stands at the end of the neighborhood’s ferry dock. The newly constructed tower, whose address is 21 India TOWERS BY THE FERRY DOCKS You’ll see another, more famous sugar refinery in a couple St., is partly a condo property and partly a rental-apartment building. minutes. When you disembark at the Greenpoint dock, here’s a thought: A number of nearby restaurants and bars put out sidewalk seating if the weather’s warm enough. 7013 Louise Terrace SAT. MARCH 30TH, 9am to 4pm Household items, China, Hummels, Crystal, Jewelry and so MUCH MORE! • Cenosillicaphobia is the fear of an empty beer glass. • The world’s longest hangover lasted four weeks after a Scotsman drank 60 pints of beer. • Beer cans debuted back in 1933 when the Krueger brewery in New Jersey teamed up with a canning company to package Krueger Special Beer. All equipment & machines in excellent condition. 3 working vehicle lifts, Hunter wheel alignment machine, tire & wheel balance machine, vacuum pump, floor press, spring & strut compressor, 4 floor Jacks, smoke machine verification & leak testing. Donate A Boat or Car Today! • Hamburgers did not really catch on in the United States until the 1904 St. Louis World’s Fair • Americans alone consume approximately 50-billion burgers a year. • In 1921, Walter A. Anderson, a short order cook, and E.W. Ingram, an insurance executive, founded White Castle, the oldest burger chain, in Wichita, Kansas. The first burger sold for a nickel. • The Big Mac was introduced in 1968 and sold for 49 cents. • PETA once offered the town of Hamburg, NY $15,000 to change its name to Veggieburg. • In France kids fool their friends by taping a paper fish to their backs. When the victim discovers the fish, they yell “Poisson d’Avril!” (April Fish!) • The record for the first April Fool’s day was found to be in 1392 as cited in Chaucer’s “The Canterbury Tales.” • In Scotland, people celebrate for two days. They stick papers on people’s backs that say “Kick me”. • Some newspapers, magazines, and other published media report fake stories, which are usually explained the next day. • What did one elevator say to the other? I think I’m coming down with something. • How can you drop a raw egg onto a concrete floor without cracking it? Concrete floors are very had to crack! • What did one magnet say to the other? I find you very attractive. • How do dog catchers get paid? By the pound! • What do you get when you cross a stream and a brook? Wet feet. Sean Casey Animal Rescue has shared these photos of pets up for adoption with us. BluBlu is a two-year-old Pit bull mix. Blublu is a happy, outgoing boy that loves everyone that he meets! Aziz is a two-year-old Domestic Shorthair. Aziz is not only super handsome but also super loving! Sean Casey Animal Rescue (718-436-5163) is located at 153 East Third St.
Fidelis Care is fully committed to Equal Employment Opportunity and to attracting, retaining, developing, and promoting the most qualified employees without regard to their race, gender, color, religion, sexual orientation, national origin, age, physical or mental disability, citizenship status, veteran status, or any other characteristic prohibited by state or local law. EOE. ADVOCATES FOR SERVICES FOR THE BLIND MULTIHANDICAPPED INC. (ASBM) is hiring staff to support blind/deaf multihandicapped individuals with intellectual / dev. Disabilities. Bklyn: Asst. Mgr. for BayRidge group home. Exp. preferred. Sign language a plus, but will train. Direct Support professionals needed for Bronx/Brooklyn Group Homes/Brooklyn Dayhab... all shifts, ft., pt, per diem. Bronx: Supervisor positions avail. Experience preferred. Competitive benefits, growth opportunities. Obituary JOHN PATRICK MCPARTLAN, SR.
ohn Patrick McPartlan, Sr, aged 97, resident of The Hideout in Lake Ariel, PA, died Sunday morning at the Hospice of the Sacred Heart in Dunmore, PA., surrounded by his loving family. He was the husband of the late Sally Ann O’Connor McPartlan. Born in Drumkeeran, Leitrim, Ireland, he was the son of the late James and Mary McVey McPartlan. He came to the United States in 1947 where he settled in Jackson Heights, Queens with his sister Molly and her family. He was employed by the NY Railroad for several years, and prior to his retirement, he was employed by Sunnydale Farms in Brooklyn, New York. He was a parishioner of St. Patrick’s Parish in Bay Ridge Brooklyn, NY prior to becoming a parishioner of St. Thomas Moore Church in Lake Ariel, PA. He was a member of the Knights of Columbus. He grew up playing traditional Irish tunes on the flute and accordion and would occasionally entertain family and friends. He liked to play a round of golf with his sons and was a long suffering, yet loyal New York Mets fan. Surviving are his daughter Terry McPartlan of Brooklyn, NY; his son, John Patrick McPartlan, Jr. and his wife Karen Chizmar McPartlan of Scotch Plains NJ; his son, Dennis James McPartlan and his wife Eileen Dowd McPartlan of Milltown NJ; his son-in-law, Martin Bajo of Staten Island, NY; grandson Jeffrey Michael McPartlan and his wife Stacey De Torres McPartlan; granddaughter Christie Lynn McPartlan Fitzpatrick and her husband, Kevin Fitzpatrick; granddaughters, Caitlin Ryan Bajo and Heather Rose Bajo, grandson Sean Patrick McPartlan, and granddaughter Colleen Mary McPartlan, and great-granddaughter, Lily James McPartlan, as well as several nieces, nephews, and cousins. Special Thanks to Jessyka O’Heren long-time caregiver, friend, and someone we all consider a family member. He was preceded in death by his wife, Sally Ann O’Connor McPartlan, his daughter Mary Ann McPartlan Bajo, and siblings, Molly McPartlan Kelly, Annie T. McPartlan, Thomas McPartlan, Bridget McPartlan Carney, Edward McPartlan, and Josie McPartlan. Visitation will be on Tuesday, March 26, 2019 from 4 pm to 8 pm at the James Wilson Funeral Home, 143 Gravity Road, Lake Ariel, PA and Wednesday morning, March 27, 2019 from 9 to 10:30 am. A mass of Christian Burial will be celebrated on Wednesday, March 26, 2019 at 11 am at St. Thomas Moore Church, 105 Gravity Road, Lake Ariel, PA. Interment will follow at St. Catherine’s Cemetery, 220 Church Street, Moscow, PA. In lieu of flowers, donations may be made to the Hospice of the Sacred Heart, 600 Baltimore Drive, Wilkes-Barre, PA 18702. To leave an online condolence, please visit the funeral home website at www.jameswilsonfuneralhome.com.